According to some indigenous cultures, the strawberry is "woman's medicine," carrying its seeds on the outside, and creating the shape of a heart when cut in half. In the last 20 years, over one thousand women and girls have gone missing in Canada, with many of these cases going unsolved. Meanwhile in Canada, indigenous children are largely over-represented in foster care and indigenous men and women are over-represented in our prisons. 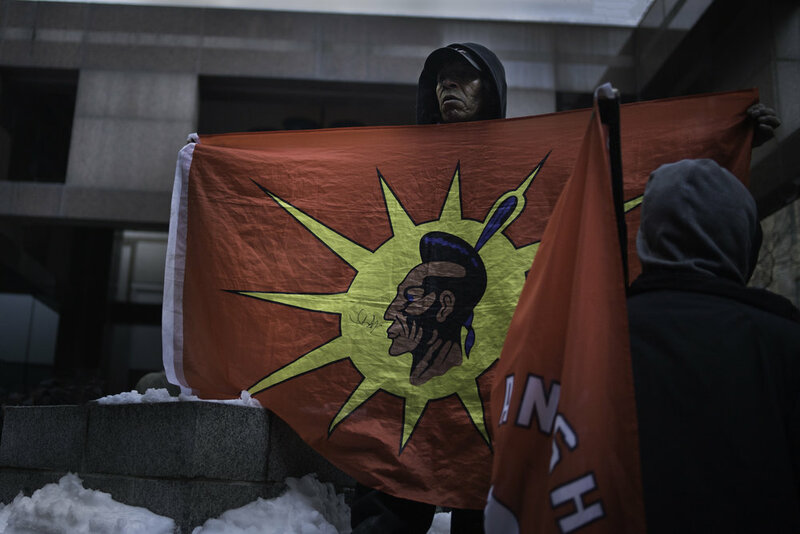 Every year on February 14, a day that has been commercialized as a day of love, red roses and red hearts, thousands of people all across North America gather to honour the lives of missing and murdered indigenous women and girls, and in Toronto, the 10th annual "Strawberry March" this took place this past Wednesday. The march drew large crowds that bore witness as family members of murdered and missing indigenous women and girls told heartbreaking stories. To honour these women, strawberries were offered to the grieving families. We encourage our community to learn and stand alongside us in honouring these women, girls and their families. An honour song in progress for family members of missing and murdered indigenous women. Hundreds of people showed up in solidarity at Toronto Police Headquarters. Women play at a round dance in the middle of College and Gerrard. Round dance at College and Gerrard. "I sweat for belonging." The march ends at the YWCA where a meal is waiting.